NEW YORK , NEW YORK, USA, April 15, 2019 / EINPresswire.com / -- From the Emergency Rental Assistance Program to HASA, New York's vulnerable and at-risk populations often rely upon the city's numerous emergency housing initiatives. A decades-long supporter of these and other vital, much relied upon housing schemes, Barry Hers takes a closer look at both emergency and non-emergency housing and rent assisted accommodation programs available in the Big Apple. 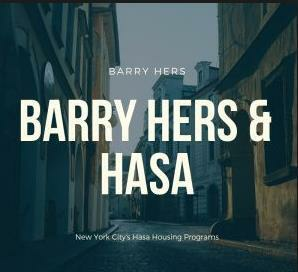 HASA—originally the HIV/AIDS Services Administration—exists to assist individuals living in New York City with AIDS or HIV-related illnesses, in order that they may live healthier and more independent lives, according to Barry Hers , with services also recently extended to include low-income residents of the city who are HIV positive but asymptomatic. "HASA also offers a number of other services," he adds, "including assistance in helping to apply for services such as Medicaid, transportation and cash assistance, mental health and substance abuse screening, treatment referrals, and employment and vocational services." "It has given me great pleasure," Barry Hers adds , wrapping up, "and I'm incredibly proud to have been able to make a difference here in New York City."